Wholesomes™ Large Breed Chicken Meal & Rice Formula is made without high-water, low-protein meats and common grains like corn, wheat or soybeans. Wholesomes™ Large Breed Chicken Meal & Rice Formula nutritionally balances Omega-6 and Omega-3 fatty acids to promote good skin and hair coat. Fortified with glucosamine and chondroitin sulfate, Wholesomes™ Large Breed helps to maintain healthy joints. 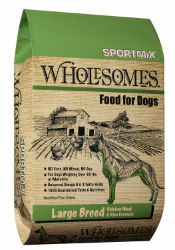 SPORTMIX® Wholesomes™ Large Breed Chicken Meal and Rice Formula supplies your dog with a naturally preserved, 100% complete and balanced diet for a healthy active life. A standard 8 ounce measuring cup hold approximately 3.9 ounces of SPORTMIX® Wholesomes™ Large Breed Chicken Meal & Rice Formula. Calorie Content (calc. ME) 3,550 kcal/kg, 375 kcal/cup. SPORTMIX® Wholesomes™ Large Breed Chicken Meal and Rice Formula Food for Dogs is formulated to meet the nutritional levels established by the AAFCO Dog Food Nutrient Profiles for maintenance of adult dogs. Chicken Meal, Brown Rice, Brewers Rice, Chicken Fat (preserved with mixed Tocopherols), Rice Bran, Dried Beet Pulp, Flaxseed, Dried Egg Product, Potassium Chloride, Salt, Choline Chloride, DL-Methionine, L-Carnitine, Glucosamine Hydrochloride, Chondroitin Sulfate, Vitamin A Supplement, Vitamin D3 Supplement, Vitamin E Supplement, Zinc Sulfate, Ferrous Sulfate, Niacin, Calcium Pantothenate, Riboflavin Supplement, Copper Sulfate, Pyridoxine Hydrochloride, Thiamine Mononitrate, Manganese Sulfate, Zinc Proteinate, Manganese Proteinate, Copper Proteinate, Calcium Iodate, Cobalt Carbonate, Folic Acid, Sodium Selenite, Biotin, Vitamin B12 Supplement.